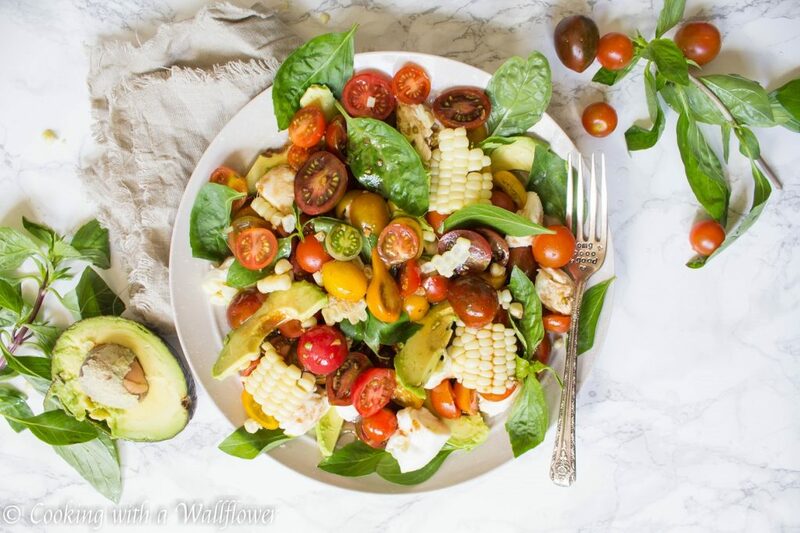 Sliced tomatoes, fresh basil, fresh mozzarella, avocado, and corn tossed in a honey balsamic vinaigrette. 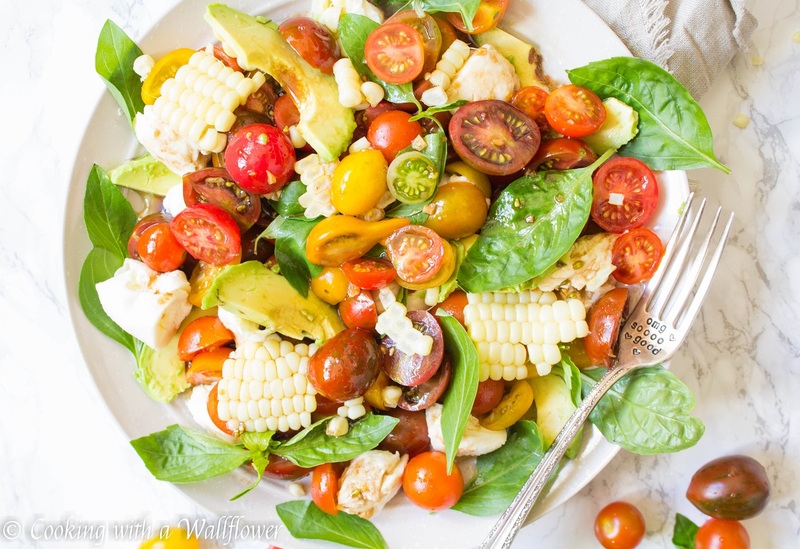 This avocado corn caprese salad is so delicious and refreshing. Oh, I can’t believe that it’s Memorial Day weekend in just a couple days. I don’t really have much planned since I work on Saturday, so it’s not like I have a long weekend either. Sadly. But I love that it signals the beginning of summer! 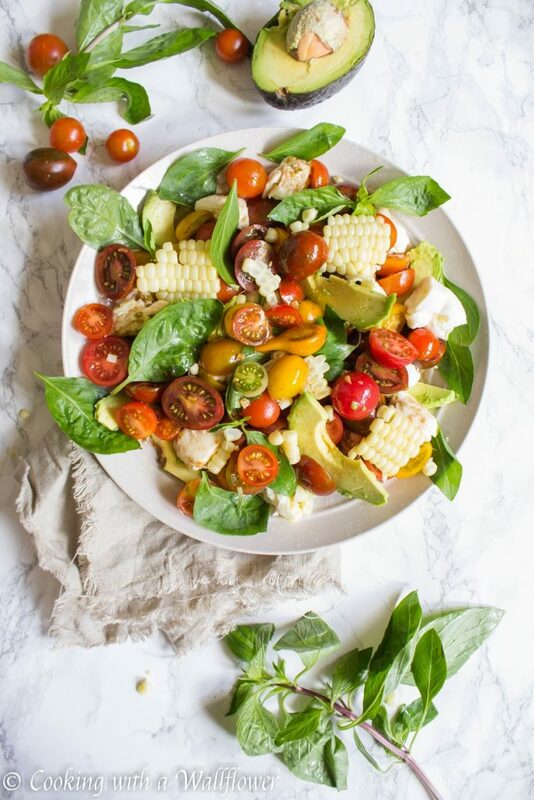 Fresh sweet tomatoes, juicy berries, corn on the cob. That summer life is almost here! Along with barbeques and picnics and walks along the coastline. So of course, I’m all ready for it! 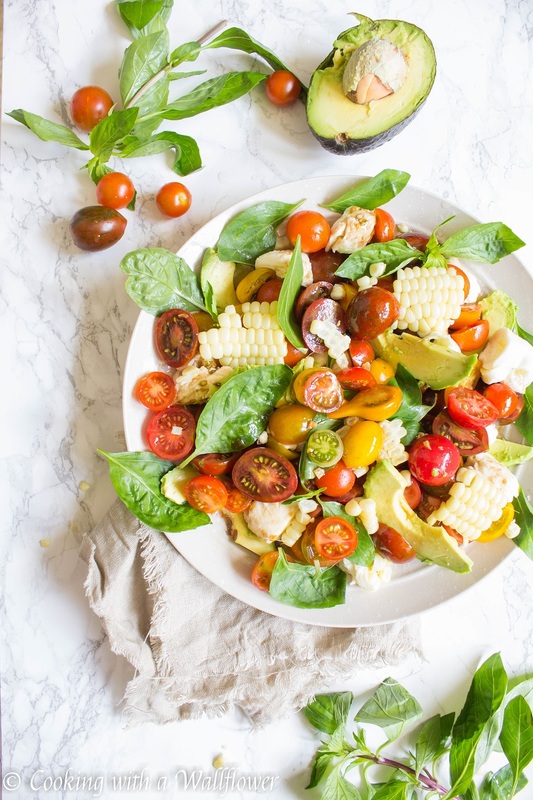 And I’m about to share with you a new summer staple: avocado corn caprese salad. 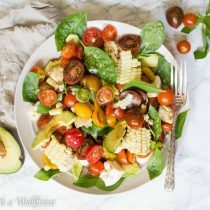 If you’re grilling this weekend, or any of the upcoming weeks, this avocado corn caprese salad is the perfect side for you. It takes just minutes to put together with simple ingredients. And they taste soo delicious and refreshing too. Every single bite is a balance of creaminess and sweetness and the tanginess of balsamic vinegar. In a medium sized bowl, whisk together balsamic vinegar, minced garlic, olive oil, honey, pinch of salt and pepper until incorporated. Slice grape and cherry tomatoes in half, and toss in the balsamic vinaigrette. Allow the tomatoes to sit for 10-15 minutes. Use a slotted spatula or spoon to remove the tomatoes from the bowl and place them onto a plate. Reserve the balsamic vinaigrette. Tear up fresh basil. Slice avocadoes. Tear up fresh mozzarella into small bite size pieces. Cut corn kernels fresh off the cob. Place all these ingredients on the plate. And pour the reserved balsamic vinaigrette over the avocado corn caprese salad. Serve the avocado corn caprese salad cold. In a medium sized bowl, whisk together balsamic vinegar, minced garlic, olive oil, honey, and pinch of salt and pepper until incorporated. 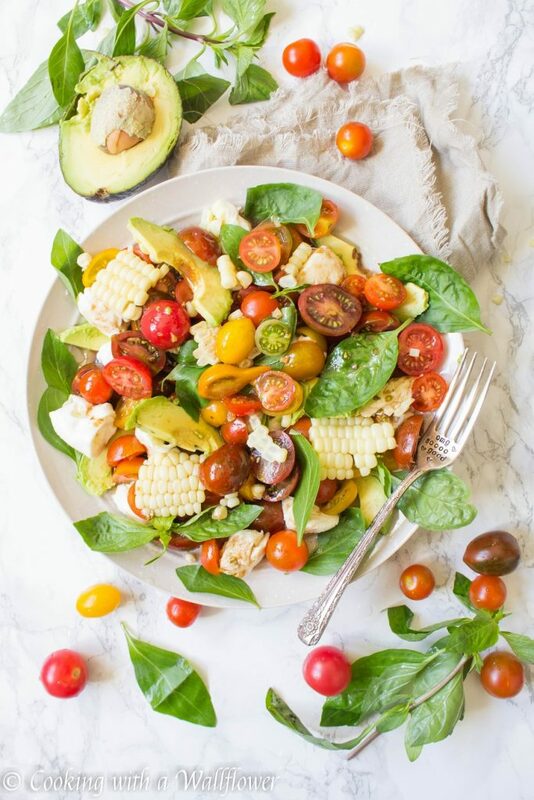 This entry was posted in Farmer's Market, Gluten Free, Healthy, Quick and Easy, Recipes, Salad, Spring Cravings, Summer Cravings, Vegetarian and tagged avocado, caprese salad, gluten free, quick and easy, salad, vegetarian. Ooh chunks of sweetcorn, I never think to do that! 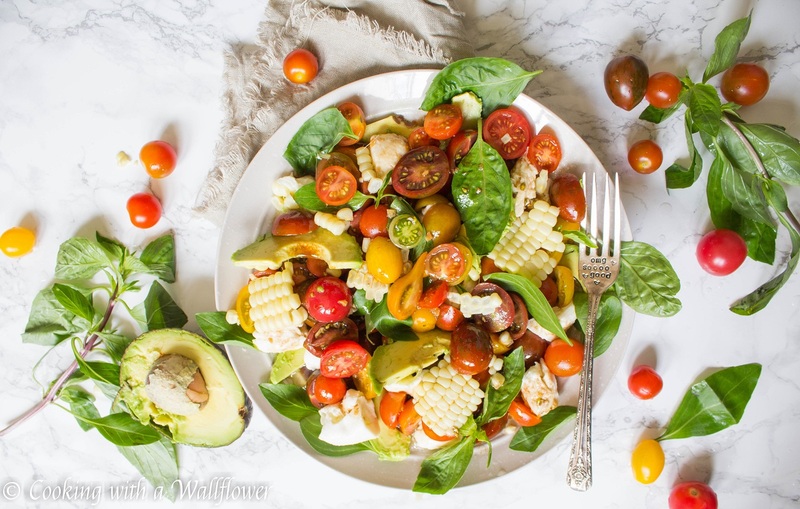 What a perfect summer salad, Andrea. Thank you so very much for sharing! Have a wonderful Memorial Day weekend. Oh! I taste this one through the screen. Yum! That looks so yummy, I’m making it for our gathering!! I love the way you kept the corn attached, how do you do that? Use a knife and just cut down the side of a corn on the cob. I love the way it looks on salads!